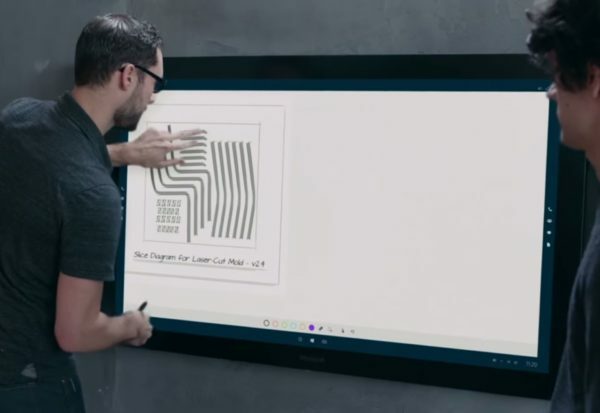 Download this TalkingPointz 2Pager for additional information on the new Microsoft Surface Hub, expected to be released in the 2nd half of 2015. It comes in two sizes, including an giant 84-inch model. The Surface hub is a 4K display that runs Windows 10. It’s outfitted with an enormous set of built in peripherals including large speakers, dual-cameras, proximity detectors that activate it on approach, and a touch-screen display that supports simultaneous users. It Microsoft’s premium approach for the digital conference room. There’s no word on price or availability yet, but my guess is “priceless” for most organizations. However, future models could appear in a conference room near you. This all-in-one computer will also replace many devices in a conference room including a separate video conferencing solution, separate computer and monitor, whiteboard, speakerphone, and projector. The Surface Hub is Skype for Business Ready.